In an industry where everyone is boasting, it’s refreshing to meet a line that places its philosophy as delivering what amounts to as “the little black dress” version of skincare. Kari Gran, based out of Seattle is a green brand focused on the less is more approach of simple yet elegant solutions centered around plant oils. I know there are many choices when it comes to purchases, and Kari Gran makes it quite easy and compelling with a Starter Kit of the essentials: Cleansing Oil, Lavender or Rose hydrating Tonic, Essential Serum & new Three Sixty Five SPF 28 in really chic UV bottled travel sizes. Kari Gran Cleansing Oil: This is a non-emulsifying cleansing oil, meaning it’s best to follow with a 2nd cleanser or with a washcloth. As with all cleansing oils, apply to dry skin and massage away. 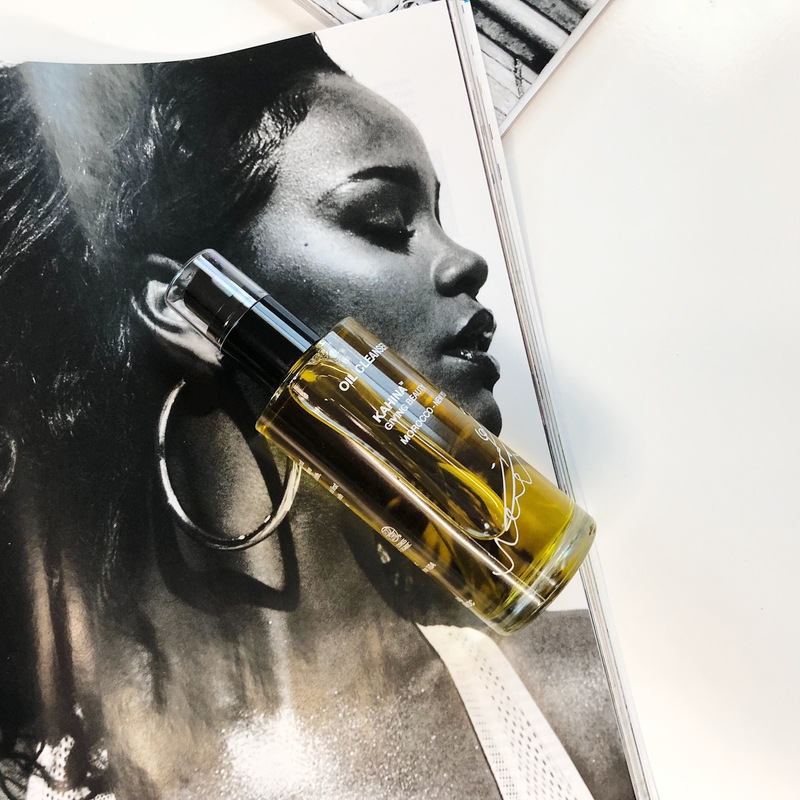 The texture of this oil is the perfect thickness that doesn’t leave skin greasy but also isn’t like a dry oil that just disappears into skin after a few seconds. I like cleansing oils to be viscous enough that there is some cushion and this delivers on that effect. 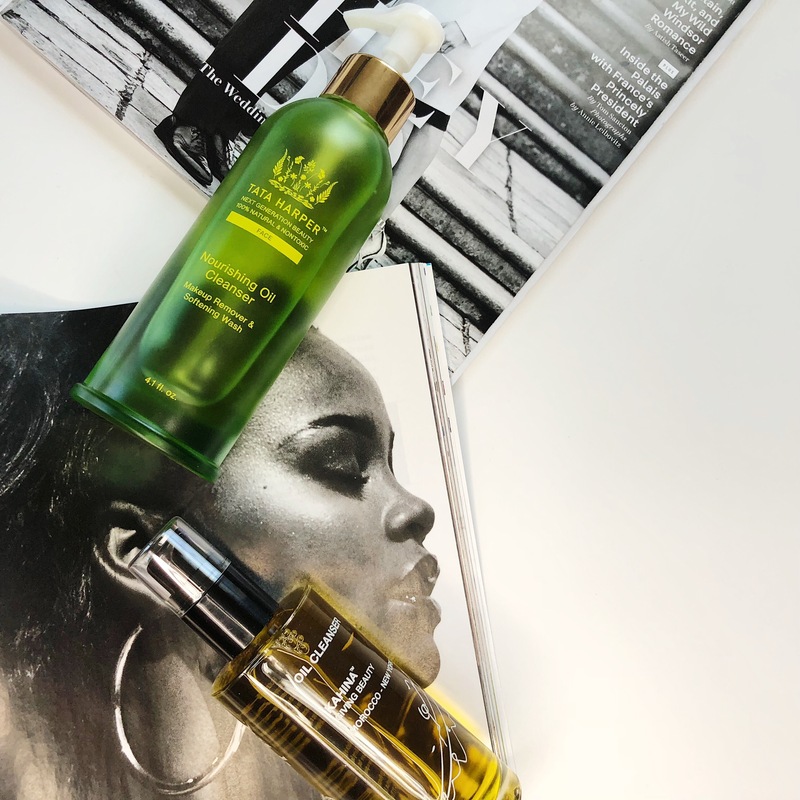 The simple ingredient list of only 5 ingredients is very high quality, unlike other cleansing oils where beneficial plant oils are toward the middle of the ingredients list. Kari Gran Lavender Hydrating Tonic: This tonic is available is in lavender or rose. Since the cleansing oil and essential serum have a dominant lavender fragrance, this tonic was a fantastic middle step. I actually really enjoyed this tonic and felt it was excellent as a setting spray and layered well with the essential serum. The ingredients list for this is even simpler: 3 ingredients – distilled aloe vera leaf, organic glycerin and organic lavender. But unlike other lines where simple compositions can feel incomplete or a little too DIY-ish, this feels well done. Kari Gran Essential Serum: The essential serum is Kari Gran’s answer to face oils. In here there are actually 15 plant oils, among them, my favorites are camellia oil, rosehip oil, calendula oil, and essential oils of lavender, rose, jasmine, ylang ylang. The scent works with the rest of the line and I’d describe it as more of a blend between lavender and ylang ylang, though on the floral fragrant side in a good way. Ingredients list: Organic Camellia Oleifera (Camellia Seed) Oil, Organic Rosa Canina Fruit (Rosehip Seed) Oil, Organic Helianthus Annuus (Sunflower) Oil, Organic Simmondsia Chinensis (Jojoba) Oil, Organic Persea Gratissima (Avocado) Oil, Organic Prunus Amygdalus Dulcis (Sweet Almond) Oil, Organic Olea Europaea (Olive), Organic Helianthus Annuus (Sunflower) & Organic Calendula Officinalis (Calendula) Oil, Organic Olea Europaea (Olive) & Organic Arnica Montana (Arnica) Oil, Organic Lavandula Hybrida (Lavender) Oil, Wildharvested Boswellia Sacra (Frankincense) Oil, Rosa Damascena (Rose) Oil, Jasminum Sambac (Jasmine) Oil, Organic Hippophae Rhamnoides (Sea Buckthorn Seed) Oil, Organic Cananga Odorata (Ylang Ylang) Oil, Tocopherol (Non-GMO Vitamin E from Sunflower). What I’ve found is that Kari Gran really nails the texture, whether they’re using 3 ingredients or 15, the products go on the skin and feel just right. You never feel lacking, as the products provide a polish and elegance that belies that often times sparse ingredients list. The compositions really do work like minimalist little black dresses and for that reason, I’m inclined to recommend them for everyone as they would just fit so effortlessly especially at their fairly reasonable price points. Every once in a while, a beauty line comes along that makes me stop in my tracks. Nowadays, it seems everyone has a new line that promises to be different and this and that, so often the message can feel a little overwhelming. 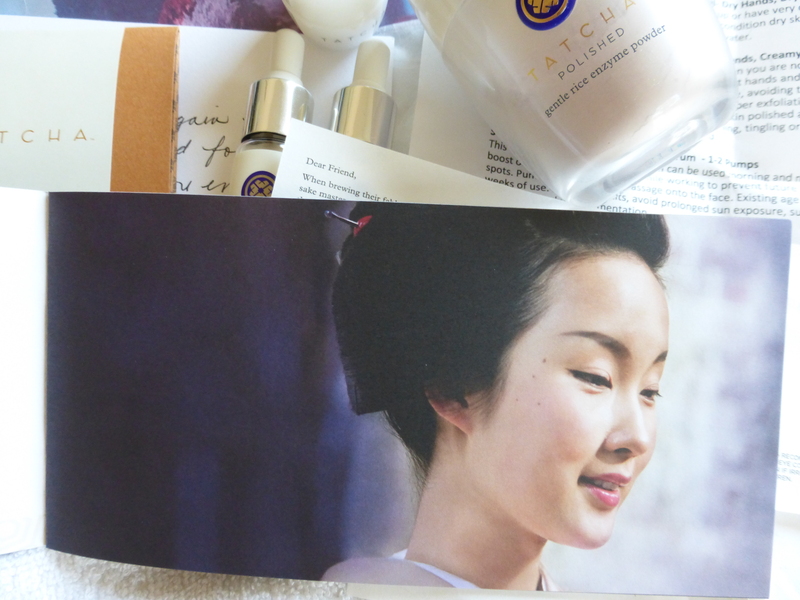 Not so with Tatcha, a brilliant line that has a beautiful message that is only equaled by their exquisite packaging (I have seriously never seen a line as detail oriented and focused to delivering a luxurious experience in their packaging). When was the last time a line just let you take a step back “enjoy the simplicity”? 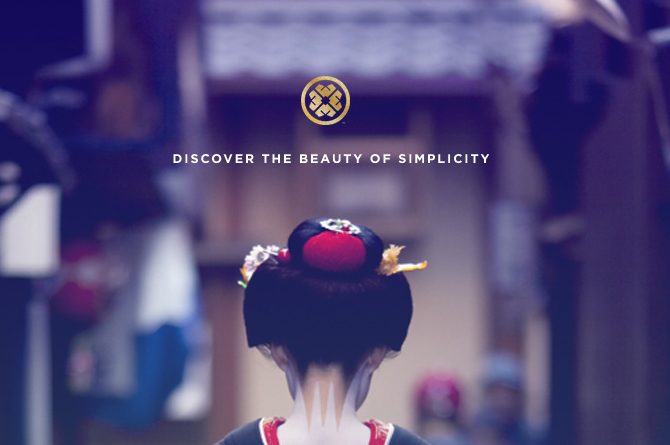 Tatcha is inspired by ancient Geisha beauty secrets, looking towards the past for the secrets to beautiful skin. The products use a proprietary anti-aging Hadeisi-3 complex which consist of time-tested ingredients crucial to Geisha beauty routines: Green Teas, Okinawa Red Algae, and Rice Bran Extract. The promise is simple: traditional secrets from Eastern Beauty for a modern woman. 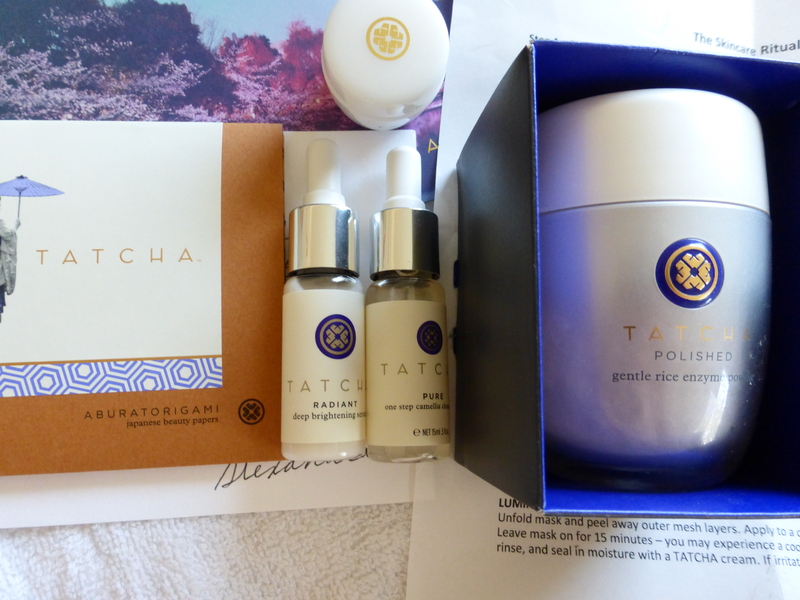 I was honored to receive my own kit that allowed me to try the Tatcha Ritual. It included a full sizes of the Gentle Rice Enzyme Powder and Original Aburatorigami, as well as samples of the One Step Camellia Cleansing Oil, Deep Brightening Serum, and Supple Moisture Rich Silk Cream. One Step Camellia Cleansing Oil: A wonderful cleansing oil to remove makeup and water-proof sunscreen from face. 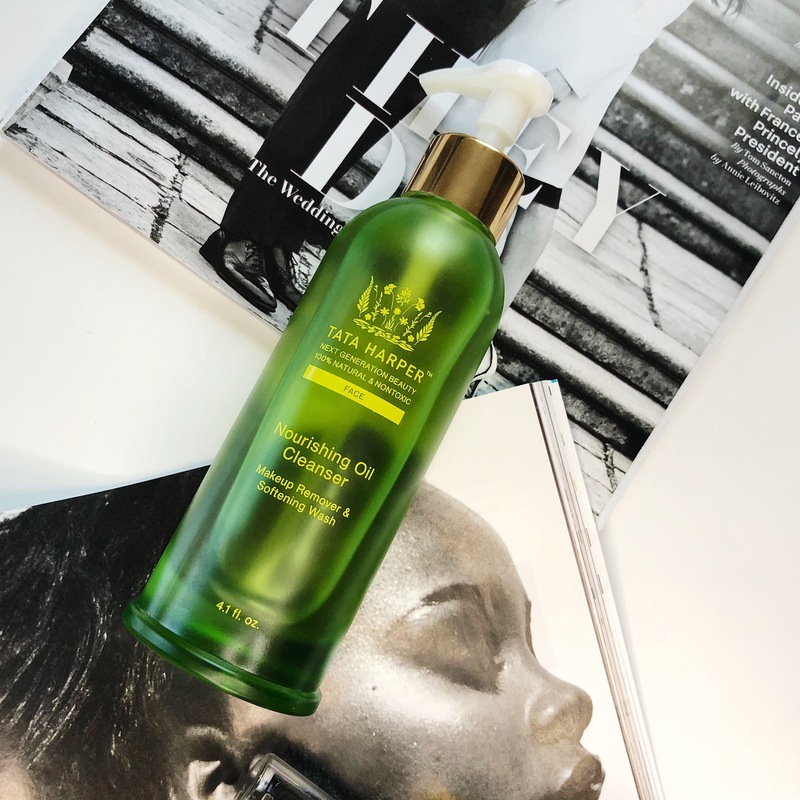 It felt lighter than the typical cleansing oil and the scent was very light and fresh, both qualities that I think are due to the Camellia Oil. Camellia Oil is better than normal cleansing oils because it is very rich in antioxidants while also being very nourishing to skin due to high fatty-acid content. Rice Bran Oil is also used which is high in skin-softening Vitamin E. These are very fitting oils to use as they both have long history in Asian culture (the Camellia Seed oil is extracted from the same plant that makes teas), so I can definitely see how the Geisha have mastered incorporating this into their routine over time. Although this is a cleansing oil, there are emulsifiers which cause the oil to turn milky upon contact with water, so the oil will wash off easily. 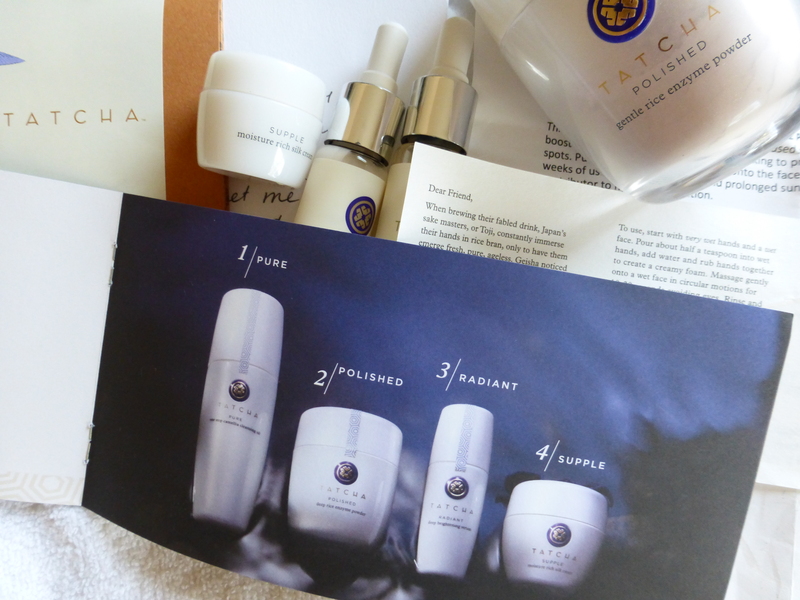 Deep Brightening Serum: Like all of Tatcha’s products, this serum is very light and sinks quickly into skin. However, like most serums, it does tend to leave my skin with a sticky film (which is why I always follow up serums with a facial oil or moisturizer). The first time I applied this serum, I could ‘feel’ it go to work. It’s hard to describe as there wasn’t a tingling or adverse reaction, but I knew it was doing something. That initial sensitivity subsided after continued use. The main actives that any brightening should probably accredited to are from the Rice family as both Rice Bran, Rice Starch, and Rice Germ Powder figure into the ingredients. Rice is indeed known to be a skin brightener, and although I don’t have sunspots or age spots to speak of (fortunately), I do imagine that continued use of this product can lighten their appearance. Supple Moisture Rich Silk Cream: I was initially concerned about using a moisturizer in the warmer months since I already have oily skin but as a dedicated beauty blogger, I decided to chance it – and I’m glad I did. No breakouts to speak of and my skin is very balanced. I like to use this during the day under my sunscreen which can be pretty drying when used alone due to the silicones. This moisturizer isn’t just a simple cream, but almost a gel-cream consistency which allows even those of us with oily skin to use this without fuss. There are many active ingredients including Royal Jelly Extract (wonderful for replenishing collagen loss), Silk Protein, Wild Thyme (great for acne prone skin), Ginseng root, Algae Extract, and Green Tea Extract. Just looking at the list, I feel it is the perfect moisturizer for all skin types due to a delicate but well-formulated balance of great ingredients. Gel-creams such as this are my favorite because when done right, they provide the moisturizing properties of a cream but the cool, weightless feel of a gel. Original Aburatorigami Blotting Papers: these natural papers are made from leaflets of the Abaca Leaf, and infused with gold flakes throughout. You might be wondering what sets these apart from other blotting papers, and I did too when I first saw them. It turns out that these natural leaves are incredibly balancing, so they absorb excess oils without leaving skin stripped (and therefore producing more oil). I was quite surprised at how absorbent they are, and 1 sheet definitely can go for an entire night without being completely used. Gentle Rice Enzyme Powder: I saved this for last because it is my favorite product in the entire line. It’s a water-activated powder that exfoliates and cleans skin without harsh abrasives. This powder is truly addictive to use and is unlike any other product I’ve used before. Simply pour half a teaspoon in the half of your hands. Add water and it turns to a cream. It lathers up a great deal, and feels like a very gentle milky cleanser once applied to the face. I hesitate to even call this an exfoliator because it truly is not a “grainy” scrub, but rather a gentle creamy cleanser suitable for most sensitive skin types. The enzymes are very effective and the first few uses I saw it get rid of blackheads around my nose that most cleansers cannot seem to handle. The entire use process is very fast and simple, so if you’re put off by powders, give this a chance. Upon washing off you’ll notice your skin balanced (somehow this removes excess oil without stripping skin) and soft without being irritated. I find myself bypassing my usual cleansers for this. So that’s the general rundown of the line. For full disclosure, the line uses a lot of natural ingredients but it isn’t a 100% Clean line like those on NMDL. There are instances where I would prefer formulating with less alcohol, phenoxyethanol, silicones, etc. but that doesn’t take away from my general love of the products as they are. If it seems I am gushing about their products, it’s because I am a fan. Despite my outspokenness, I do enjoy writing about things I love and this line is one that I absolutely adore. 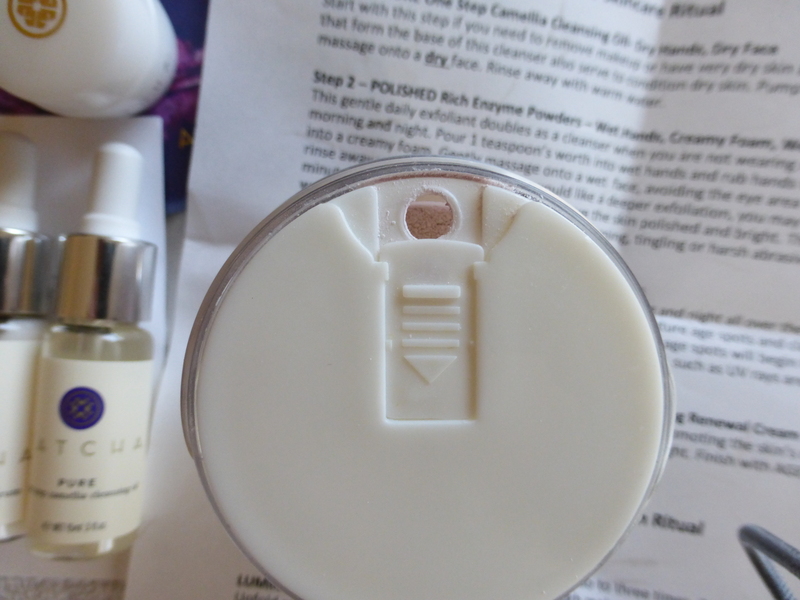 All the products are so gentle and seem to be lovely to my skin. I applaud the brand consistency and the focus on the product experience. After my experience with their ritual, I’m now interested in more of their range including their Hydrating Mist and Lifting Mask. 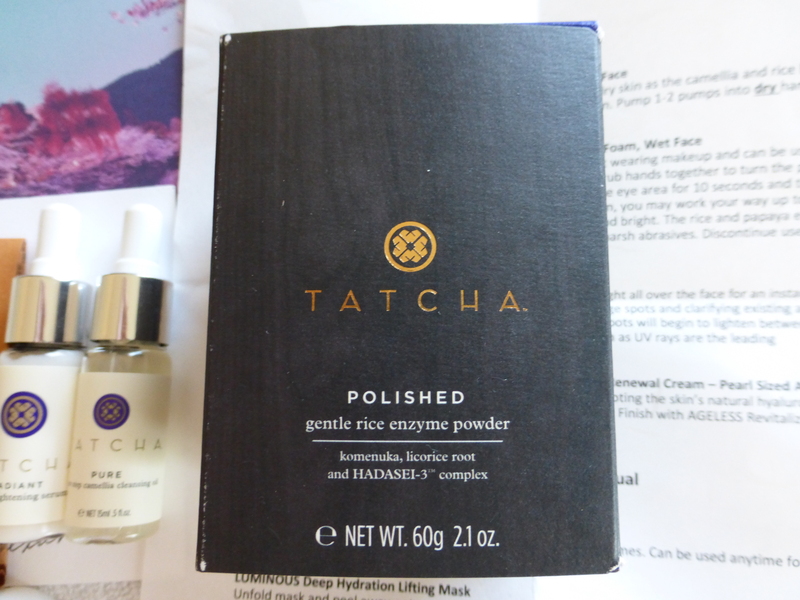 Has anyone else used Tatcha? What do you think? I love discussing new lines, so drop a comment! When it comes to beauty products, I would describe myself as being on the adventurous side! I remember using the Shu Uemura Cleansing Oil, it was my first oil cleanser. I was so surprised at how soft it made my skin feel and how great of a job it did in removing my make up. However I always hard a difficult time ‘washing’ the oil off and the fact that they used mineral oils really bothered me. I also tried out the Amorepacific Cleansing Oil which was beautifully packaged, but the fragrance was too strong for my taste. I feel like with skincare, it’s always a delicate balance. I don’t think a cleansing oil is versatile enough to act as a sole cleanser, and I don’t think traditional cleansers (milks, gels, creams) can really remove makeup as effectively as cleansing oils while imparting the same degree of softness (since they tend to use lots of alcohols). 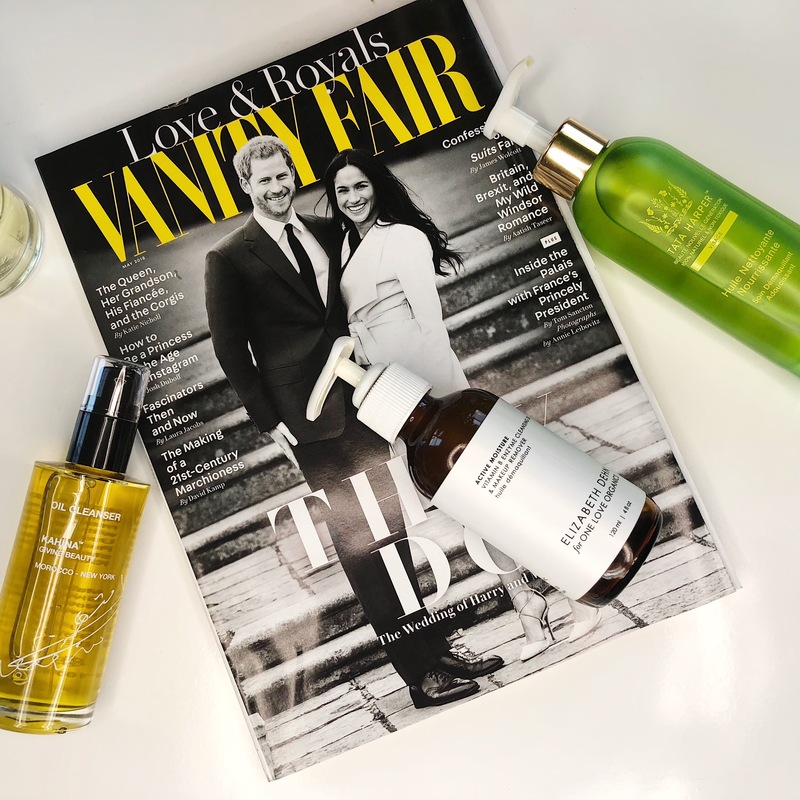 Recently, as part of my switch to cleanser products (and also keeping with my personal love of everything niche-luxury)- I decided to try out the Clarity cleansing oil/makeup remover from Vapour Organics. At $28 for 1 oz, the price is actually quite reasonable. The major base oils in here are: Sunflower, Castor Seed, and Jojoba, which are known to be soothing and moisturizing to skin. Castor Seed and Sunflower are a little ‘rich’ for my skin type but as this is just a cleanser and not something I’m leaving on my face, I wasn’t too concerned. You might notice the lack of preservatives in this oil and that is because the container dispenses product via an airless pump to keep airborne bacteria out. 2 Pumps of this stuff applies removes all traces of makeup when massaged into skin. I’ve used this to remove a face of: Sunday Riley Cashmere SPF 30, Sunday Riley Tinted Primer/Korres Primer, Koh Gen Do Foundation, Edward Bess Concealer, Shiseido Bronzer, Koh Gen Do Powder – not to mention eye products, etc. All layers are off in a minute. Besides just removing makeup, it also nourishes skin and imparts a soft, dewy finish. The oil itself is thicker than what I am used to, but my skin handled it just fine. I think this is a must-have product for heavy makeup days for these reasons but not a daily cleanser especially if you’re just going out sans makeup. But for the ladies who want a very cleanly formulated product that will remove all their makeup, you will not be disappointed.